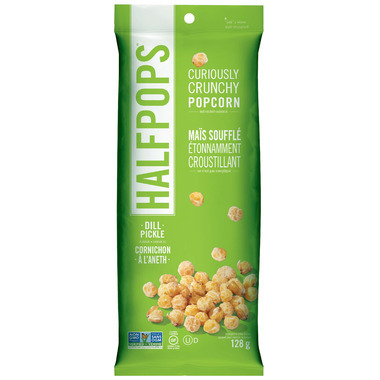 Halfpops Curiously Crunchy Popcorn Dill Pickle is not rocket science - it's simply half-popped popcorn! Ingredients: NON-GMO POPCORN, NON-GMO CANOLA OIL, DILL PICKLE SEASONING (ORGANIC VINEGAR POWDER, ORGANIC TAPIOCA MALTODEXTRIN, ORGANIC DISTILLED WHITE VINEGAR POWDER, SUGAR, SEA SALT, GARLIC POWDER, ONION POWDER, SPICES, DILL WEED, CITRIC ACID, NATURAL FLAVOURS). For anyone who loves the half popped popcorn at the bottom of a popcorn bag... this is for you!! Loved the crunch, such a nice treat. Can't wait to try out the other flavours. I tried other flavours. Nope. This is THE flavour. Addictive. These are great if you are a popcorn fan. The bag contains a sizable amount and the flavor is dill pickle with a punch. Delicious and crunchy snack. Great replacement for chips. Also vegan dill pickle! !